My granduncle Marshall was born 29 Dec 1904 in Rome, Floyd, Georgia. My grandfather was born 17 Feb 1908 in Lincoln, Talladega, Alabama. Phyl said somewhere that they moved to Lincoln about 1908, rented a couple of years and then bought about 300 acres. The best I can figure, his farm was pretty much everything you can see on the map. Allred Road runs through my ggrandfather's 300 acres. When I was a child Speedway Boulevard wasn't there, and to get to my grandfather's house we would take 77, and turn (very carefully) onto a dirt road that is now called Allred Road. It looks like Alpha's house is still there; the first house on the right just as you turn onto Allred Road from 77. There were several houses along the road to my grandfather's house. The last one was a stone house where the Welshs lived, about where Texas Street splits off. 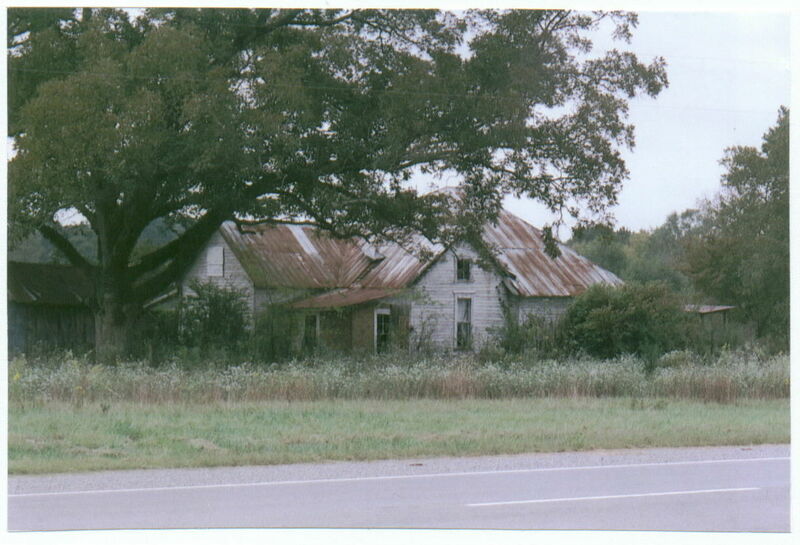 My grandfather's house was where Texas Road meets Allred Road. There is a cluster of buildings where my grandfather's house and farm buildings were. Texas Road was the road to the pasture and fields. Before Speedway Boulevard was built, what is now Allred Road continued to where Speedway Boulevard is, bore right (along the route of the Current Speedway Boulevard), and connected to W. Merkle Lane and Jackson Trace. There was also a 'private' road, on the other side of the field next to Allred Road/Speedway Boulevard, that went from my Grandfather's house to my Great-Grandfather's house. It met Speedway Boulevard about where the 'Speedway Blvd' label is. There was a covered well there long ago. And the old Allred House with its gardens and barns and stables and so forth were under that label. The old house was really a compound. There was a covered well where the 'private road' and Speedway Boulevard intersect. And there was a cookhouse behind the kitchen. 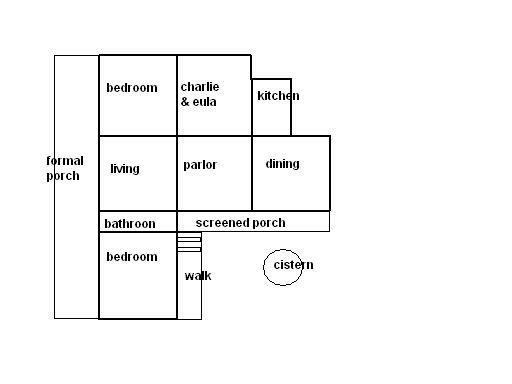 And a barn, a stable, a carriage house, a smoke house, a hen-house, an out-house, a cistern and other outbuildings. Most of the outbuildings were falling down when I was there as a child. I think they pulled the barn down because they were afraid I would be out playing and it would fall on me. I can remember asking what the building behind the kitchen was and being told it was the cookhouse, and that long ago before white sugar and bleached flour and gas stoves people cooked over a wood fire. And they made the kitchen a separate house because it burned down. They also told me some places had separate wash houses but they didn't. When I was a child there was still a huge cast iron kettle in front they used to heat water. And the chopping block was nearby for chopping chickens (and other things). The old piano-organ was in the front hallway (converted into an indoor toilet about 1965)useless, the bellows eaten by rats. Sue showed it to me. It had three stops, one for piano, one for organ, and one for both. It was a player piano-organ and they still had some old scrolls. I can imagine Susie all dolled up, sitting there pumping away, just as happy as she could be. I forgot how many mules Agnes said they had, she wrote it in a letter and I remember at the time thinking he was richer than the O'Hara's because it was two more than walk across the screen in stylized 'Egyptian' fashion at the very beginning of Gone With The Wind. I remember when I was a child and first going to visit Bea, Sue & Agnes in the old house, I asked about the ancestors. Bea at first informed me, distastefully it seemed to me, that they were 'black-Irish'. When I asked what that meant she said they were Indian. And when I asked what tribe she said Muskogee. Fifteen or twenty years later I wrote them asking again about the ancestors, and this time Bea wrote "A confederat soldier up 'n' married a Injun Princess." Well, that would most likely be John James Allred, except if it was Lucinda or Mary Ann Maroney that was the Indian Princess firstly that was a long time after the Trial of Tears in 1838 and secondly neither me nor aunt Bea would be descended from the 'Injun Princess'. Agnes said her daddy refused to pay the road tax. I was astonished to learn they had to pay taxes for roads, and they explained to me that you used to have to pay to travel on the roads. Especially the good roads. And that you also had to pay a tax to build them and maintain them. And Paw Allred refused. He would work on the road but he would not pay for it. Agnes also said he used to preach. And she said his preaching was mighty different from everyone else's, or any other preacher she ever heard, but she couldn't seem to find the words to explain how. Susie said they were prominent, and there wasn't nothing happened of any importance that they didn't have to be there. And from the number of people who came to her funeral, I can believe it. He was a raging liberal by the standards of the time and the place, putting one girl at a time through school, and paying for it. Sue, Bea & Agnes may not have been born in that house, but they lived in it all their lives, and they died there. When I was there they had pulled their beds into the living room and the three of them slept there. All the bedrooms were unused, stacked from floor to ceiling with furniture and trunks and things both used and unused. The roof was high and steep, so there was a lot of room up there as well, enough for several large rooms. All the rooms were large. And there were doors in every wall, except the exterior walls, one room opening onto another. The rooms were so large they could accommodate long sofas on either side of the doors in the middle of the wall leading from room to room, with room to spare. I remember my grandma was grumbling about the way they dressed, wearing styles that were dated 20 years ago, and she claimed they didn't have to do that, that old man Allred had left them trunks full of money. When I was about twelve I asked them about that. I remember how they looked at one another, trying to figure out what to say. Finally, I think it was Susie who asked if they thought they could trust me, and Agnes and Bea nodded yes, they 'spec they could. And so we went in to Grannie & Paw's room and they pulled a trunk out from behind the others and there was a little pile of silver dollars. Maybe a hundred or so. Susie said, "That's all that's left." Charlie died in 1950, and this must have been about 1965-70. It seems I spent infinite and endless summer afternoons on the screened-in porch with Bea, Sue, & Agnes; eating chocolate covered cherries and drinking R.C. Cola and playing Rook, and Canasta, and Rummy, and Parcheesi, and Chinese Checkers. It was cool near the cistern and under the huge shade tree that over-reached the house (the tree grew toward the cistern, both the top and the bottom). And the screen keep the insects out. You can see the roof line over this porch in the family picture, which was taken from the side of the house. (The other photo was taken from the opposite side, the 'back'.) The carriage-house/garage was to the right of where everyone is standing. There was a paved cement walk from roughly where Charlie is standing to steps up to the porch and into the house. The cistern was to the right of the walk. Somehow we never got a picture of the front and that is a real shame because it really was pretty. The 'formal' front porch was very wide, and embellished with ornamental wood banisters and woodwork. The house had a tin roof. And it was wonderful in the rain. There was a drain from the roof into the cistern, and I remember how sweet the water was. Sue told me it was because of the lime in the concrete. I remember asking if there were dead animals in there, and Sue said, "Of course not." And then Agnes timidly said she saw a rat in there once. And Sue gave her a "Not one more word," look, and Agnes didn't say anymore. The gardens were unkempt and overgrow when I was there. It was like Miss Haversham's house. Time had stopped there somewhere around 1930. But it had the sense of having been quite grand and wonderful once, quite something. This was very difficult to type with all the legal mess. I hope you can figure it out since your brain is much more intelligent and younger than mine. As I see it with the first email I sent the land totaling 577.5 acres and this email land totling 130 3/4 acres that totals 708.25. I think I have more deeds and will forward as soon as I locate them. 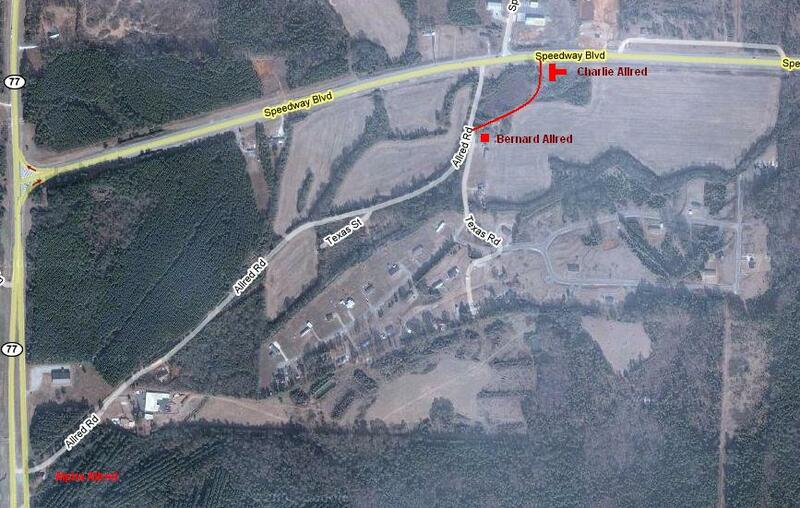 Also remember that Highway 77 does not follow where the old highway from Lincoln to Talladega was. At one time we lived on property that was across where highway is now and Daddy got that land from Grandpa. Some way when the estate for Grandpa was settled a small part of that land had not been sold when Daddy sold the mountain property and it is a part of Grandpa's Estate at the time of settlement. I think this is a description of that property. A parcel 105 feet by 210 feet located in the Southeast quarter of Northeast quarter of Section 5, Township 17, Range 5. This indenture made and entered into by and between J. Clint Hollingsworth and wife Mattie L. Hollingsorth parties of the first part and C. P. ALLRED, party of the second part. All of the North East quarter of the southeast quarter the east half of Northwest quarter of southeast quarter (E1/4 of NW1/4 of SE 1/4; the North third of the East half of the Southwest quarter of the Southeast quarter(N1/3 of SE 1/4 of SE1/4 of E1/4) all in Section 4 (4) Township (17), Range 5 , also 20 acres of land situated in the Northeast quarter of the Southwest quarter (NW1/4 of SE 1/4) of Section 4 Township 17, Range 5, commencing on the section line dividing the north half and and the south half of said section four at a point 605 yards east from where the above described half section intersects the section line which divides the above section four and section section 5, township 17, thence from such starting point along said half section 495 yards to a point, thence North 195 5.9 yards to the point of the beginning; also twenty eight and three quarters acres, more or less of land lying and being located in South half (S1/2) of section 4 Township 17, Ramge 5 bounded on the West by the land of L. F. Box , on the North by lands heretofore belonging to grantors herein conveyed, on the south of the big ditch and on the east lands of grantors herein conveyed and being all the lands sold and conveyed to them by these three certain deeds recorded in the office of the Judge of Probate Talladega, Alabama in deeds records 68, page 199, 70 page 191, and page 75 page 88 all hereto referred to and made a part hereof as if fully set out herein. Said lands herein granted being 130 3/4 acres, more or less. To have and to hold unto the party of the second part, his heirs and assigns in fee simple forever. Said parties of the first part for themselves, their heirs, executors, and assigns hereby covenant that they are seized of an indefeasible estate in fee simple in and to said lands and have a good right to sell and convey the same, that the same are free from all incumbrances and they do warrant and will forever defen the title of said premises unto said party of the second part, his heirs and assigns from and against the lawful title, claim and demand of any and all persons whomsoever. Witness our hands and seals this 13 day of September 1919. 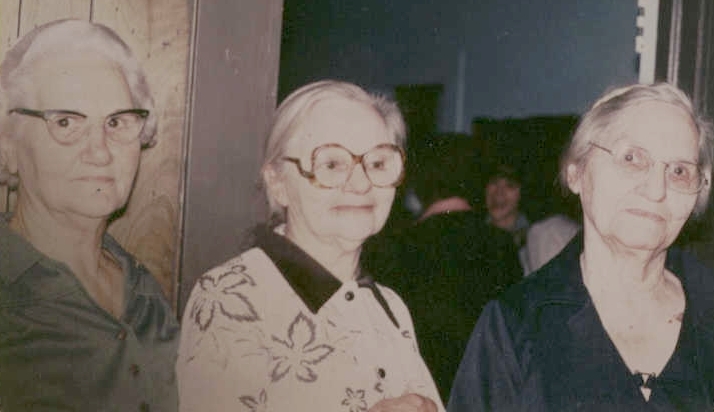 J. Clint Hollingsworth and Mattie L. Hollingsworth. This acreage totals 577.5 Acres Grandpa paid 2000.00 cash for 25 October 1927. At that time 2000.00 was a lot of money. I have Grandpa's Will and deeds where he gave each son land. At some time when you have a place to keep these documents I will send them to you. His will might be of interest now. He was a very well to do man and his will is very interesting. The money he had took care of Sue and Bea for the remainder of their lives. The reason I have some of the papers (which I had forgotten about) was because so many years went by after the death of Bea and there were so many heirs that no one thought the estate would ever be settled. Bobby Mims, Aunt Eula's daughter offered to buy all the remaining 35 acres (What was left after each boy got their land from grandpa) at 300.00 an acrea. No one would sell for 300.00 an acre because the land was worth much more. Bobby Mims filed suit and the courts auctioned off the land. I will send more information in another email. The south two-thirds of East half of Southwest quarter of Southeast quarter of Section 4; the South two-thirds of Southeast quarter of Southeast quarter of Section 4; the South half of Northwest quarter and the South half of Northeast quarter of Section 5, and the North half of Section 9; all in the Township 17, South of Range 5 East, containing 520 acres, more or less. Also, the following described tract or parcel of land: Beginning at an iron stake located on the South boundary line of Section 4, Township 17 South, Range 5 East, and on the South edge of public road leading from W. E. Franklin's to E. G. Merkle's, thence East along South boundary line of said Section 935 years, more or less to center of Southwest quarter of Southeast quarter, thence North to Southwest corner of land of J. Clint Hollingsworth and thence further North along West boundary line to big ditch, thence Southeast along said ditch to land of L. F. Box, thence South to a point or iron stake located 3.07 chains North of South boundary line of said section, thence West about 15 chains to iron stake, thence Southwest 4.30 chains to beginning point, containing 57-1/2 acres, more or less, in South half half of Section 4, Township 17 South, Range 5 East, being the property conveyed to the undersigned grantor on the 5th day of April, 1921 by mortgage of W. E. Franklin and which said mortgage was recorded in the office of the probate of Talladega County, Alabama, in Mortgage Record 160 at page 53, which said mortgage was thereafter foreclosed by the undersigned grantor as evidenced by foreclosure deed dated the 18th day of March 1925 and recorded in the office of probate judge of Talladega County, Alabama in Deed Record 83 at page 325. The red outline is the 1919 purchase. The yellow outline is the 1927 purchase. I, Charles P. Allred, a resident of Lincoln, County of Talladega and State of Alabama, and ever the age of twenty-one years, being of sound mind and disposing memory, do hereby make and publish this my last will and testament, revoking all former wills which may have been made at any time heretofore by me. FIRST. I will that all my debt and funeral expenses shall be paid by my executrix as soon after my decease as practical. SECOND. I will, devie and bequeath to my wife, Eula Allred, the full use and control of all property, real, personal, and mixed, which I may own at my death or to which I may be entitled, during the term of her natural life. THIRD. After the death of my wife, the use and control of all remaining property of my estate shall be vested in my two single daughters, Susie E. Allred and Florence Beatrice Allred, so long as they remain single and, in the event that one of them should marry, then the use and control of said estate shall be vested in the remaining single daughter so long as she lives and remains as an unmarried woman. FOURTH. After the death of my wife and the marriage or death of both of my single daughters above named, then all remaining property of my estate is to be sold by my Executor or Executrixes as herein named and the proceeds divided among the heirs of my body as the aw directs. FIFTH. I nominate my wife, Eula Allred, as sole Executrix of this my last will and testament and I direct that she be not required to give any bond or other security for the fiathful performance of her duties. SIXTH. After the death of my wife, my single daughters above-named shall be named as Executrixes of said estate as long as they are unmarried and I direct that they be not required to give any bond or other security for the faithful performance of their duties. In testimmony whereof, I have hereunto set my hand and affixed my seal at Lincoln, in the County of Talladega and State of Alabama, in the presence of W. H. Dickinson, M. F. Hearn and E. D. Acker, whom I have requested to become attesting witnesses hereto, on this the 15 day of April, 1937. That is the side of the house in the background. The front (West) side is out of view on the left. I have always been told there was a Native American grandmother,( in both the Hogue and the Allred families) but I don't know as of yet, which generation. That would have been scandalous then, as it was illegal for a Native American of a registered tribe to live in Georgia for many years after the "Trail of Tears". I think that those who were Indian, pretended to be white. There has got to be a good story here, wish I could find it! I saw the same internet site you mentioned, where Sue, Bea & Agnes are listed. I also wondered why the others(Eula, Alpha, Marshall, Shelton and Daddy) were not shown. About the genealogy program, I probably wouldn't try to merge files, as the program I have has enough problems without my help. But we can share information, I can scan you copies of things, just let me know if you need what I have recorded,(the family and children with dates back to John James Allred). I can't take credit for all the work, a cousin sent a lot of it to me. I was going through some papers today that I had when Daddy went into the nursing home and found a number of deeds of land owned by Grandpa Allred. He owned much more land than we thought. I found one deed for 530 acres bought in 1921 – another deed for 130 acres bought about the same time – and a number of deeds for smaller pieces of land. I think if all I have are added up at one time he owned close to 1000 acres. When I can find the time I will try to put it all together. At some time when you have a home and can keep these deeds I will send them to you. [S9] Ancestral File, FamilySearch, (Salt Lake City, Utah: Intellectual Reserve, 1995-2005), 1C06-B5C (Reliability: 3). [S171] Census, U. S. Federal Government, (HeritageQuest) (Reliability: 4). [S10] Allred Family Roster, Donald Clemont Allred, (Woodland Hills, California: www.allredroster.com, 1988-2008), ED01060105 (Reliability: 2). [S2] Canada, Craig, J. Craig Canada, What I remember (Reliability: 4). [S245] Ellis, Bernice, Bernice Ellis, (Ohatchee, Alabama), EMail of 28 Oct 2007 (Reliability: 4). [S245] Ellis, Bernice, Bernice Ellis, (Ohatchee, Alabama), Talladega Probate Minute Book 52, Pages 111-112 (Reliability: 4). [S84] International Genealogical Index, FamilySearch, (Salt Lake City, Utah: Intellectual Reserve, Inc.), "Alabama, County Marriages, 1809-1950", William Roscoe White & Agnes Allred (Reliability: 4). [S171] Census, U. S. Federal Government, (HeritageQuest), 1900, Georgia, Floyd County, Militia District 455 North Carolina, Sheet 7a (Reliability: 4). [S390] Aldridge, James, James Aldridge, EMail of 27 Jul 2008 (Reliability: 3).